The KODAK PLAYSPORT Video Camera Bundle was made for avid hunters and anglers. Included in the bundle is the exclusive green KODAK PLAYSPORT Video Camera, a hard camouflage carrying case, a camouflage Kodak Flex-Pod tripod, a remote control, a camouflage neck strap, a 4 GB memory card and an extra battery to extend the life of your video camera. The KODAK PLAYSPORT Video Camera Bundle is everything you need to capture your hunting and fishing adventures. You will enjoy the freedom you have to take the KODAK PLAYSPORT Video Camera wherever your adventures take you. The tripod, remote control and extra battery will unleash unlimited possibilities for your videos. The built-in software and USB cable make editing and uploading simple. 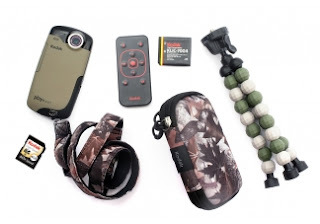 Item Reviewed: New Kodak Playsport Camo Bundle for Solo Hunte 9 out of 10 based on 10 ratings. 9 user reviews.